I had discerning parents. They knew the benefits of heading into the southern regions of Snowdonia National Park and many of our summer camping weekends were spent on the shores of beautiful Bala Lake exploring this lovely region to the full. We fished, swam, walked along lake and nearby sea shores and climbed the hills and, whenever I visit this area today, the memories of those family times flood back. The good news for today’s visitor is that little has changed in this charming and visually stunning playground. You can still enjoy much of what I did as a youngster as Bala is still a great place to visit today, and the surrounding road network is good enough to allow it to be used as a centre for touring from while still giving yourself a wonderful retreat to return to at day’s end for a meal and glass of wine. Bala (Y Bala) is a busy market town with plenty of charm and is centred around the long main wide street, Stryd Fawr (The ‘High’ or ‘Great’ Street). There are plenty of places to eat ranging from cafés to pubs serving decent food and the shops, although not large in number, still give enough variety to service the visitor and local alike. I often passed through the town on my way back from climbing The Cadair Idris and Rhinog Mountains and was shocked one winters evening to see a ‘Subway’ had appeared on the main street. It seemed so out of place and character but I have to admit to stopping and using it many times once I got used to it being there. Bala is, in reality, a small market town with a population of just under 2,000 people. In the 18th Century it was known for the manufacture of flannel, stockings, gloves and hosiery. The town hosted The National Eisteddfod in 1967, 1997 and 2009. On 16th June 2016 Bala temporarily changed its name to ‘Bale’ in support of Real Madrid striker Gareth Bale and The Welsh football team as they progressed in UEFA’s Euro 2016 competition. If you were in the town at this time you will have also noticed the prominent statue of MP Thomas Edward Ellis (1859 – 1899) was adorned with a Welsh Football shirt too. Historically it is believed The Romans were one of the first here with the 30ft high ‘Tower of Bala’ (‘Tomen y Bala’) being a ‘moat hill’ which is thought to mark the site of a Roman Fort. You won’t spend much time in the town before you hear the tale of Mary Jones who, in 1800, set out from remote Llanfihangel-y-Pennant (about 25 miles away) to walk to Bala to buy a Welsh Bible she had saved six years for. She was 15 at the time and, being from a poor family, had no shoes, but this devout Welsh Protestant completed her journey and bought her Bible from the Reverend Thomas Charles. Her actions inspired the founding of The British and Foreign Bible Society and her home and memorial can still be visited in Llanfihangel -y-Pennant today. If you look on the walls of Barclays Bank on Bala High Street you can see a plaque that commemorates the fact that this building was the one where she finally received her Bible. On the outskirts of Bala there is now a ‘Mary Jones World’ that tells Mary’s fascinating story. In 1854 the writer George Borrow visited Bala on his walking tour of Wales which he recorded in his famous book ‘Wild Wales’. He stayed at the White Lion Hotel and was enchanted by Bala Lake which is still the reason most people visit this area today. The lake (‘Llyn Tegid’ which translates as ‘Lake of Serenity) is Wales’s largest natural body of water and is four miles long and a mile wide. Its existence is due to the geological Bala Fault line on which it lies. The River Dee runs through it and the lake has its own fish, The Gwyniad, which is unique to its waters and was trapped here at the end of the last Ice Age some 10,000 years ago. The Gwyniad is a member of the whitefish family and some of the fishes eggs were transferred to nearby Llyn Arenig Fawr between 2003 and 2007 as a conservation measure as they were being eaten by The Ruffe (a fish introduced to Bala Lake in the late 1980’s). Local legend has it that the lake is inhabited by a monster known as ‘Teggie’ and it is said that on moonlit nights the palace and buildings of King Tegid can be seen underneath the waters! In severe winters the lake completely freezes over and the last times this happened were in 1947 and 1963. 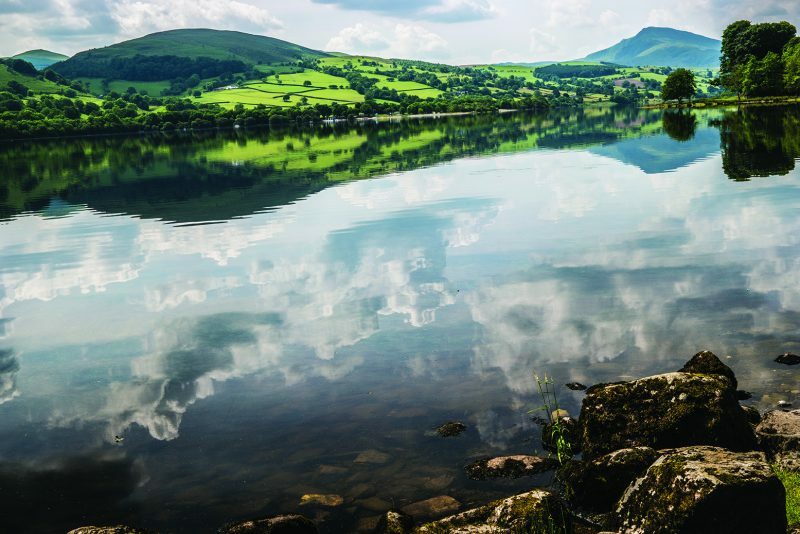 But for most visitors Bala Lake simply means unbelievable scenery, lakeside picnics, fishing (the lake has large stocks of pike, perch, brown trout and eels) and water sports. Kayaking, canoeing, yachting and windsurfing can be enjoyed and all types of boats can be hired to enjoy everything from a simple paddle around to a serious session out on the lake itself. For many visitors it will be enough to simply sit on the beach areas of Bala Lake enjoying an ice cream or coffee as they gaze down the length of the lake to the awesome Arran Mountains that tower majestically in the distance rising to 14 separate summits over 2,000ft. These is just one range that can be explored by experienced hill walkers here. To the north west of the lake you will find the Arenig summits (13 tops over 2,000ft) too, but be warned, these are remote and tough ranges to walk on and you need to be sure of your map reading and compass skills as a sudden mist could soon see you very lost. On clear sunny days these mountains offer superb walking where other walkers are few and you feel as though you are simply in the middle of nowhere. Bala Lake forms part of the aptly named ‘Welsh Lake District’ which also includes nearby Lake Vyrnwy (Llyn Efyrnwy), Llyn Celyn, Lyn Brenig, The Cregennen Lakes and Tal y Llyn, all of which are well worth a visit – if you really wanted to you could enjoy a tour of all of them in a day and still be back in Bala in time for an early supper! For extreme water sports enthusiasts The River Tryweryn running between Llyn Celyn and Bala offers ‘white water sports’ and is home to the ‘National White Water Centre for Wales’ where you can take lessons in kayaking or enjoy an hour or two of white water rafting sessions under the supervision of an experienced guide. And, finally, mention must be made of The Bala Lake Railway. This superb narrow gauge steam line runs along the southern shores of the lake from the village of Llanuwchllyn to the town of Bala and both kids and adults will love a trip on it. It is a great way to see Bala Lake and the surrounding countryside and will undoubtedly be a highlight to most people’s visit to the town and surrounding area.